While I've never met William Woolfitt in person, I'm a fan of his poetry, especially his devotion to evocative detail, for example his recent poems in HEArt, an online journal that promotes the role of artists as human rights activists. 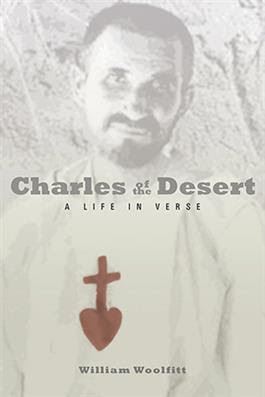 I'm glad to have a chance to review his second book of poetry Charles of the Desert: A Life in Verse. William Woolfitt is the author of three poetry collections: Beauty Strip (2014), Charles of the Desert (2016), and Spring Up Everlasting (Paraclete Press, forthcoming). His fiction chapbook The Boy with Fire in His Mouth (2014) won the Epiphany Editions contest judged by Darin Strauss. His poems and short stories have appeared in Blackbird, Image, Tin House, The Threepenny Review, Michigan Quarterly Review, The Missouri Review, Epoch, Spiritus, and other journals. He is the recipient of the Howard Nemerov Scholarship from the Sewanee Writers’ Conference and the Denny C. Plattner Award from Appalachian Heritage. Charles of the Desert by William Woolfitt brims with beautiful writing. In the book, Woolfitt tells us the story of Charles de Foucauld, a Frenchman born in 1858 to a wealthy Catholic family who, after a youthful season of debauchery, experienced a religious conversion in 1886. Charles subsequently rededicated himself to Catholicism, becoming a monk and then an ordained priest. A searcher, both spiritually and physically, his travels took him from France to Algeria, Morocco, Syria, the Holy Land, and then back to central Sahara where he lived as a man of the region in a commitment of solidarity with the local people. Charles was killed at the age of 58, some say by thieves searching for weapons and gold, some say by rebels. He had few converts while living. His influence came primarily after death, as others learned of his life and writing. The order called the Little Brothers and Little Sisters of Jesus was inspired by the example of Charles' life. He is perhaps most known for the Prayer of Abandonment and was beatified by the Catholic Church in 2005. Charles of the Desert isn't divided into sections like most poetry books. It flows from beginning to end as a biography, one enriched through Woolfitt's exquisite imagination. The poems in the book are each marked with a year and location, except for the final poem, which depicts Charles' assassination. To give an overview of the entirety of Charles' life, Woolfitt also provides both a synopsis and a chronology at the end of the book. like the pig hearts I saw, on tiptoe, at the butchery. The five poems that come after the ones in which Charles' parents are still alive touch on his life with his grandfather, his teenage years and early twenties, and his service as a soldier in military. The remainder of the book—the bulk of it—is dedicated to Charles' search for meaning, his subsequent conversion and embrace of the Catholic church, and his life as a monk, hermit, and ordained priest. The poems in Charles of the Desert range from highly narrative to tightly compressed lyric. An example of a poem that leans more narrative is "Tether," in which Charles tells us how he spent the day while in living in a monastery in Ardèche, France, " After high mass, I turn / to chores: I pull thistles, rub the brass .. // ... In my free hour, I read the breviary." An example of a more lyrical poem is "Meditation on the Hands of the Ex-Slave," set in Algeria in 1903. After Charles became a monk, he returned to Algeria, having served there earlier in his life as cavalry officer. Returning as a religious, Charles secured the freedom of slaves by paying for their ransom. In "Meditation on the Hands of the Ex-Slave," Charles studies the hands of a slave whose freedom he has purchased. This poem does a great deal of heavy lifting with few words. Looking at one stanza as an example, Charles us "He clenches them / like tree buds—never open, / always spring." One possible reading of the poem is through synecdoche, in which the slave's hands represent the whole of the man. Aristotle wrote in "On the Soul" that "the soul is analogous to the hand." If hands are a stand-in for the person, then the comparison of the ex-slave's scarred and weathered clenched fists to tree buds that never open leads to sorrow and a sense of choked promise. Those feelings are amplified in the next line, "always spring," which confronts the reader with the open-wound in the soul of the man, a wound inflicted by slavery: At first blush, one would assume the slave's freedom would be a kind of spring and that the idea of it being "always spring" might be a good thing. However, for this reader at least, I felt the opposite—that the fullness of the ex-slave's life, the unfolding of his soul here in this world, might never flower into its summer, instead remaining hidden and stifled, always tight in the bud. Give me fruits, spoils, fats, touches, tastes. or torn with teeth. I take, and take, and take. she ate forced portions, never saw the sun. while I sketch her. I like her soft and naked as a bud. costume that I will don to sneak away from officer duties. our bodies prodigal and blind, my hand reading her face. In addition to free verse poems, there are sonnets, as well as poems that follow a patterned rhyme scheme, for example one intriguing poem, "Desert Bath at Sunset." It employs the same end word using the repetition pattern of a pantoum: ABCD BEDF EGFH and so on. In addition, prose poems and epistolary poems are positioned throughout. Several of the epistles are written to a possibly fictionalized sister named Beatrix. (Biographies of Charles indicate he had one sister, whose name was Marie.) The epistolary and prose poems read like flash fiction, fleshing out the story, for example the prose poem "The Rope Maker," a version of which you can read here on page 20 under the title "Metamorphosis." The book also has a sense of immediacy to it. Woolfitt makes frequent use of the present tense, giving the story a freshness, a feeling that is just happened. This can be seen in the final poem of the book, "Someone Knocks," shown below. It's unlike the other poems in the book, with its use of white space to impact the pacing of the poem and its lack of punctuation. It leaves the reader seeing Charles' pages of translated Tuareg poetry flying with the wind, and perhaps analogously, his spirit as well scattering with those pages when he was killed. The lack of punctuation and final image render the story open-ended, suggesting that Charles lives on, which he does in a way, inspiring the Catholic faithful and others even today. Charles of the Desert is a beautifully written biography-in-verse that holds a reader's attention from the first poem until the end. Woolfitt's imagination and gift with detail bring Charles de Foucauld to life in a compelling and fresh way. Woolfitt wrote in the book's Preface that, after much research and what seemed like a stepping away from his previous autobiographical poems, "I may have made a version of Charles in my own image." Indeed, the Charles de Foucauld depicted by Woolfitt is highly personal. Perhaps that's because we can feel the heart and soul of the poet in each poem. It's a book worth reading more than once. Nancy Chen Long is a National Endowment of the Arts creative-writing fellow. She is the author of Light Into Bodies (Tampa University Press, 2017), which won the Tampa Review Prize for Poetry, and Clouds as Inkblots for the Warprone (Red Bird Chapbooks, 2013). You'll find her recent and forthcoming work in Prairie Schooner, Ninth Letter, Alaska Quarterly Review, Pleiades, Zone 3, Briar Cliff Review, Bat City Review, and elsewhere. Nancy received a BS in Electrical Engineering Technology and an MBA, worked as an electrical engineer, software consultant, and project manager, and more recently earned her MFA. As a volunteer for the local Writers Guild, she coordinates a reading series and works with other poets to offer poetry workshops. She lives in south-central Indiana and works at Indiana University.